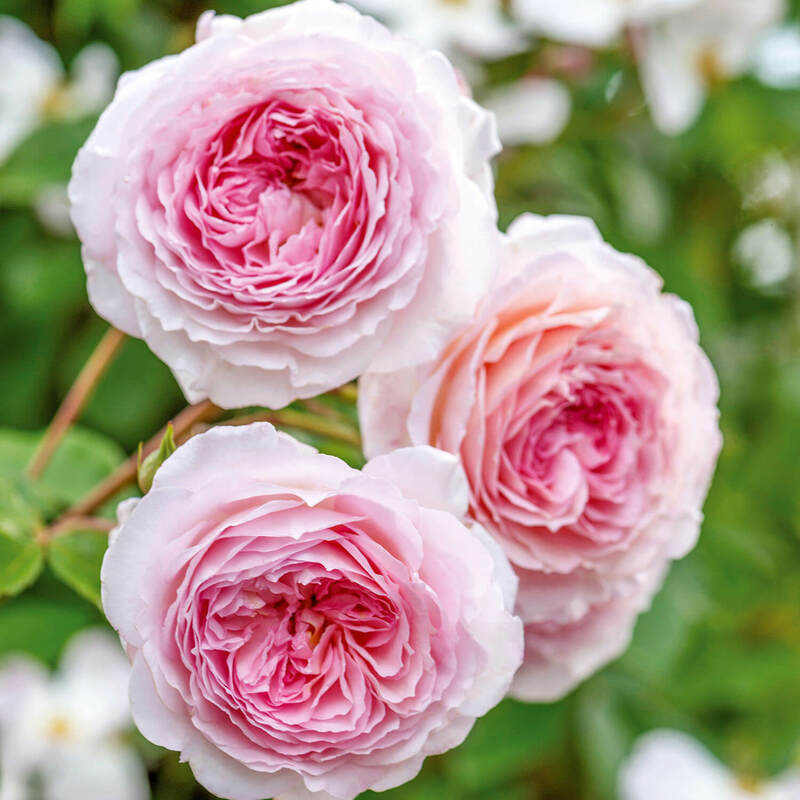 It's going to be a great year for roses! I started out with 7 from the previous owners. 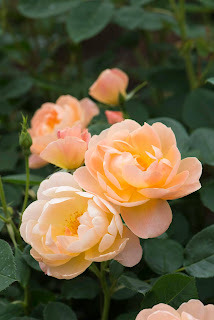 I don't know their varieties; most bloomed either orange or yellow. Also, despite my digging them up and putting them in buckets for a couple of months last summer while I renovated the flowerbeds, it looks like all but 1 survived the winter. 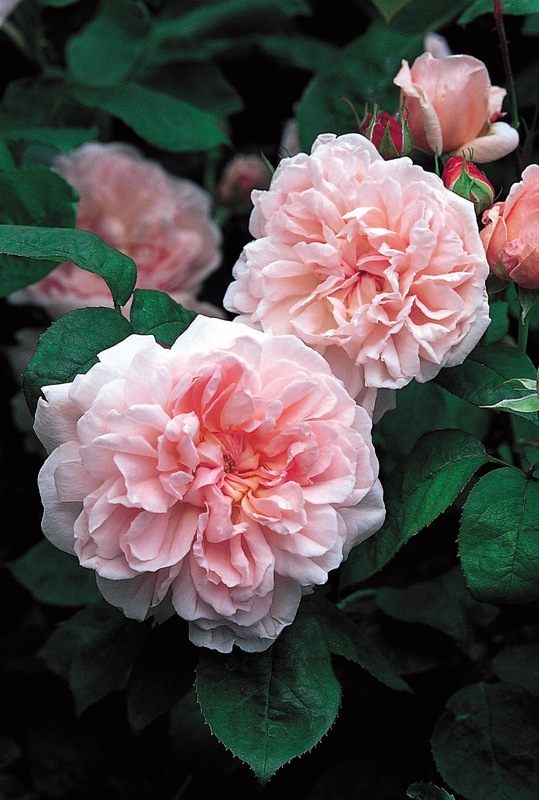 Now adding to that, I ordered 16 more English roses from David Austen Roses in Texas. They recommend you order 3 individual shrubs of each kind, then plant them 18 inches apart to make one large shrub, which is what I did for the most part. They all came in on about a month ago on a Tuesday, 2 days before a predicted snowstorm. 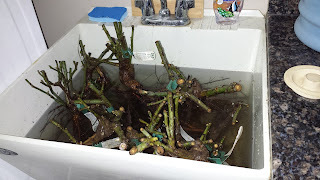 I soaked them all overnight (in my utility sink + a 5 gallon bucket, which was the only place big enough), and worked like crazy the following day to get as many planted as I could. Well, I still had to prepare the ground where the bigger shrubs were going to go, over between the garden and the chicken coop. Spent most of the day over there, digging up weeds, spreading compost, and tilling it in. My 10 year old went back with me after dinner and we worked until it was too dark to see, putting 6 roses in the ground. The others, again, waited in the utility sink and bucket for the next break in the weather. The following Saturday was a beautiful day. What's more, my sister-in-law and her 2 kids came up to help! Together we got the other 10 roses planted. So I did 5 of them individually in the front flowerbeds. 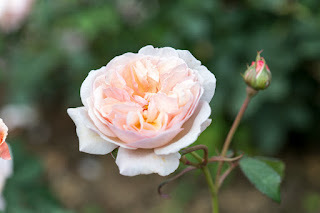 All 3 of 'A Shropshire Lad' roses had their own spots along the fence in front. 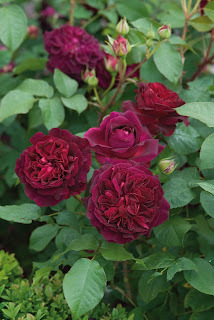 I took one of the 'Munstead Wood' and used it to replace the one rose that had died in the front oval bed. That's my purple and yellow bed, so the deep purple rose should look fantastic there! I only bought 1 of the 'Lark Ascending' bushes, with the idea all along of planting it in the corner bed next to the driveway, which we did. Then in the orchard, we planted 3 each of 'Desdemona,' 'Eglantyne,' and 'James Galway,' plus the remaining 2 'Munstead Wood's. a pink knockout, and a floribunda called 'Nearly Wild." They went over by the gravel pad, along that fence. You would think that would be enough roses for now. No, no. I bought 2 more miniature roses, 'Cutie Pie,' to cut as accents and for smaller bouquets. NOW maybe I'll be done. I still think I need a pure white--we'll see how white 'Desdemona' turns out to be--and a yellow that's an English rose. 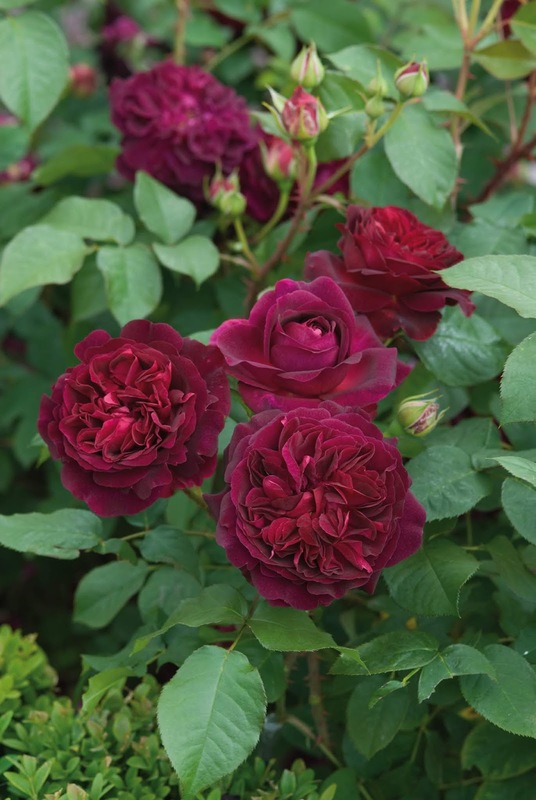 Oh yes, and some true red roses. I would love to get a trellis and train one to climb over it. Next year, maybe. 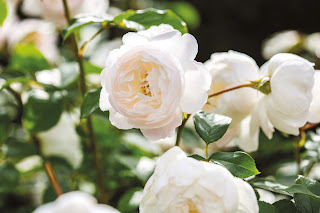 You're not really supposed to cut flowers from newly planted roses, to give them a chance to get established and all that, but I figure even if I only cut one from each I would still have enough to sell! I can hardly wait for these to bloom!